Thanks to your support, the new worldwide server, w1, is nearly full. Because of this the new worldwide server, w2, will be launched on the 3rd January at 10:30 GMT. 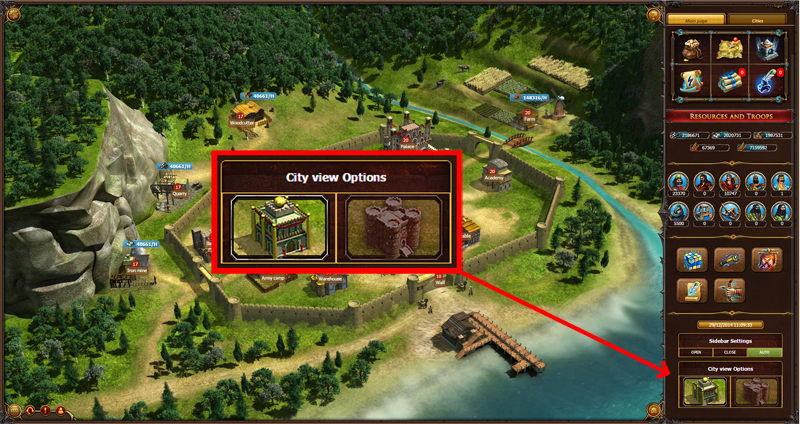 you now have the ability to choose between the old and new city view styles. Just scroll down on the sidebar to select your preferred choice. 1. Players from all language versions from all over the world can compete in one world jointly, battling for supremacy. 2. The new city has a more Asian style compared to the old version. The building and landscape artwork has changed. 3. Each building has 5 graphics that change as your level increases. 4. You can now zoom in and out of your city view. 5. The map will now be the large version for all players without the need to spend gold coins. 6. Brain teaser can now be played between all servers of kingsera and you can choose to play either Connect 4 or Othello. Resources are no longer taken from you when you choose to play a brain teaser. The brain teasers are played solely for IQ points. 7. The game has been optimised for use on mobile devices and can be played on your mobile/tablet browser. The map is compatible in the mobile browser. 9. The time to build/upgrade in you first city is 45-85% (depending on the building) less than other cities. 10. To further protect newcomers, cities are not shown on the map until there city council or farm reach level 3. Keep an eye out for new exciting stuff that will be added to the Battle of the World soon. Server 6 is coming to an end soon. The eternal scripture will arrive at 12:30pm GMT (11/12/2014) in one of the Ginghiz cities. We have a great news the new look KingsEra world wide server "Battle of the world" will start on Sunday the 14/12/2014 at 08.30am GMT. Check out the new and improved graphics and features. Become one of the first settlers in untouched territories to seize the best opportunities.